Auto Debug does not have to launch a program in order to trace it. It can be attached to a process that is already running - be it a user program or a Windows service, such as IIS or ISAPI. Refresh: because the running processes are not sampled automatically, if you start a new process after you have opened the process list, you will not see it unless you press this button. 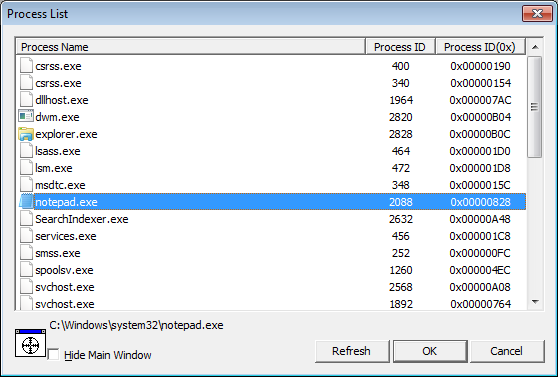 Hide Main Window: you can also select a running process for tracing by dragging its window and dropping it onto the process list. To make that easier, Auto Debug's main window disappears when you select this opiton.